OK, so this post was meant to go out YESTERDAY. Complaints Department is OVER THERE. I’ll post it anyway, rather than waiting one whole year before it becomes relevant again. For years I didn’t celebrate Mother’s Day. My mum died in 1974 and I didn’t become a mother myself until 1999. Sometimes I joined in with other people’s Mother Day lunches, teas, parties, etc. Sometimes I helped my two older sisters scoff the Mother’s Day chocolates they’d received from their own children, or helped them admire their Mother’s Day gifts. When you have felt left out on Mother’s Day, realising that you’re suddenly eligible to celebrate feels extremely nice. I loved the pre-school and nursery days and thanked my children enthusiastically for their handmade cards (90 per cent glue / 10 per cent yellow tissue paper masquerading as a daffodil) and ‘delicate’ cardboard baskets of flowers (100 per cent cereal boxes). In later years the cards became more sophisticated and have increasingly included jokes (“Congratulations on being my 2nd favourite parent!” – my son’s card yesterday. At least, I think it was a joke….). My daughter now posts Instagram pictures of the pair of us over the sixteen years we’ve known each other (was that really me?). It’s generally a lovely day. We go out for lunch sometimes, or for a country walk. Andrew usually cooks the evening meal. Last year, I was given the whole day to myself so that I could work on my writing. Cups of tea and plates of treats appeared at my elbow as if by magic. So yesterday was a low-key Mother’s Day. Andrew is only three days in from his prostatectomy. Unsurprisingly, he isn’t racing around the house in his usual fashion. I don’t hold it against him. That’s another joke, by the way, you’ve got to laugh. And isn’t there an awful lot of tat plastered around on Mother’s Day? Ridiculous slogans, posters, advertising campaigns for flowers, chocolates, cosmetics, clothes, beauty treatments – nothing wrong with any of them but for heaven’s sake retailers and businesses, we really don’t need all the reminders shoved down our throats at every street corner, ad break, and even between our tweets and popping up all over facebook. No wonder people feel left out if they don’t have a mother or they’re not a mother themselves. I mean, thanks for all the reminders. Anyway, to summarise, I loved having the mother I had for the twelve years that I did. How privileged was I to be brought up by someone as kind and intelligent and compassionate. I love being a mother to the two children I’ve given birth to. I left it all a bit late (37 and 39 by the time they came along) but what a huge amount of happiness they’ve brought me and continue to bring to me. And what fantastic mothers I’ve known over the years: my sisters and sisters-in-law, my nieces, my aunties and cousins, my friends. I’ve learned such a lot from them. 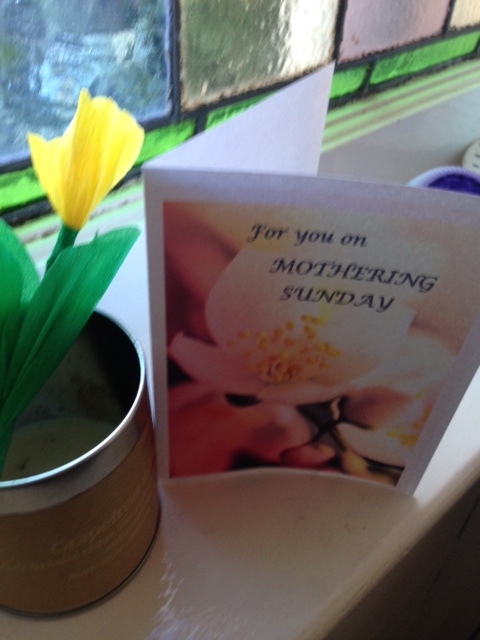 But, maybe best of all, yesterday there was a knock at my door at 7pm and our neighbour across the road, Margaret, in her seventies, said that at her church that morning, the congregation had been encouraged to take a card and paper flower to give to someone who’s been like a mother to them in recent years. And our lovely neighbour Margaret chose me! I was so moved and flattered. I’ll keep Margaret’s card safe along with my children’s cards. I am glad you decided to post this instead of waiting a year. I also didn’t get around to having children until 1999. I don’t remember feeling left out before then but there does seem to be far too much guff around these days invovling spending money. Hooray for your low key Mothering Sunday and your lovely neighbour. Hooray to you for popping in, Caroline D! Thank you. *Exactly* – there’s no need to spend money to celebrate!